Two half-snake men, one a green anaconda and one a brown python, sit coiled together on rocks with their eyes half-lidded. The anaconda is sitting higher than the python. The python man is holding the anaconda man at the waist, and one hand lower on the scaly lower half. He has a tattoo on his upper right arm. 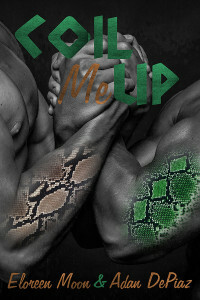 The anaconda man is holding the python man’s face, while he looks down with tenderness. He has a tattoo on his left shoulder. That dark-headed man, who is looking up at his lover, is me. We have been through a lot of heartache and trials, but we have finally made our relationship permanent. As two different types of snake shifters, we had to overcome some major obstacles. Our families put us through a lot of headaches trying to keep us part, but we overcame it all. Can you tell us how we managed to overcome those differences and our families to get us to where we are now, happy and so deeply in love? Thanks to Ingela, the fellow reviewers over at Rainbow Gold Reviews, and the LOR Authors group forum for the 1st/beta reading, encouragement, and belief in the story. A big shout out to Dana for the brainstorming help. Thanks to Eloreen Moon for allowing me to be a part of this awesome story.